﻿Excelsior Builders Ltd are a building fir﻿m who specialise in extensions and loft conversions an﻿d are based in Olton, Solihull. Our tradesmen are fully qualified, with many years experience and are happy to give any helpful and informative advice and no obligation free quotation for your proposed works. Kevin has 25 years of experience in the building industry and is a fully qualified Carpenter/Joiner by trade. Kevin says "He has a passion for what he does and having worked on many high end building projects over the years, feels he has the insight and natural ability to get the best out of any living space and make it as light, spacious and modern as possible." His other passion is Aston Villa football club, much to the disarray of his partner, Francis, who is a die hard Blue Nose! 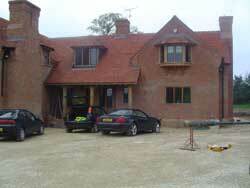 ﻿Francis also has 20 years of experience as a builder and his specialist trade is a bricklayer. He has worked on both sites and private residential properties over the years and is fast and precise at his work, with many creative ideas due to his lengthy experience in this field. "Great prices, great Customer Service, and a courteous attitude always towards our customers, is why we are constantly recommended and attract new customers." He also enjoys following Birmingham City in his spare time and has an interest in IT.